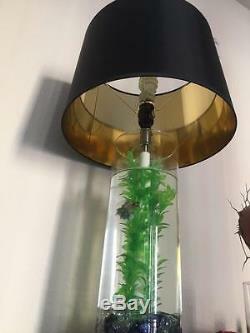 I have a one of a kind Homemade lamp. It is decorated and comes with everything you see in the pictures and more (minus the fish and the table). I will include everything you need to clean the tank and a fish net. You can use this tank for a beta or other small fish that do not require a filter. 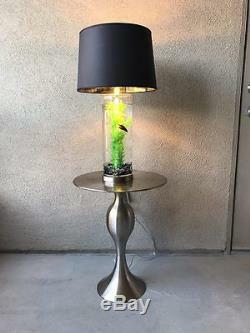 It is a glass and stainless steel tank, with a black and gold lamp shade. Colbalt blue and clear glass stones cover the bottom. Fish safe plastic plants are already attached. 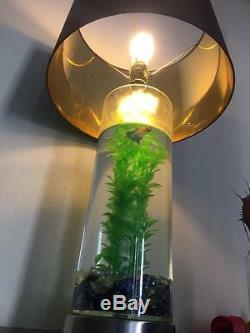 This is a water tight vase converted into a usable lamp. That being said, please UNPLUG the lamp BEFORE attempting to clean. All you have to do is put in the stones ad water and add the fish. If you would like me to make you a custom lamp let me know what you are looking for and I will get you a price and a date I can make it available. I can do specialty rocks/stones, lamp shade colors and decorative plants. 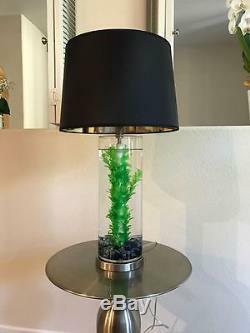 The item "FISH TANK LAMP Unique, One of a kind, Artistic, Original" is in sale since Saturday, November 19, 2016. This item is in the category "Collectibles\Lamps, Lighting\Lamps\ Electric\Table Lamps". The seller is "chrisvance87" and is located in San Diego, California. This item can be shipped to United States.